Climate change denial can be addressed using such an agnostic approach to policy where the scientific uncertainty that climate change deniers could be right after all is accounted for. It is important to be clear about terminology – ‘climate change deniers’ are 100% certain that global warming has only natural causes, ‘climate change believers’ (or non-sceptic scientists) are 100% certain that anthropogenic carbon emissions contribute to global warming, and ‘climate change sceptics’ or ‘agnostics’ attach a (small) positive probability to climate change deniers being right or at least acknowledge the possibility that global warming is not caused by anthropogenic carbon emissions at all. In the political debate, climate change deniers are sometimes euphemistically referred to as ‘climate sceptics’. In the 17th century, the French philosopher Blaise Pascal pioneered decision making under such fundamental uncertainty by asking if one should believe in (the Christian) God if one cannot prove His existence using scientific methods (Pascal 1910). His recommendation for agnostics was assertive – believe in God if you hold the slightest prior belief that God might exist. The rationale is that the cost of wrongly believing in God is minimal or at least finite, but the cost of wrongly not believing is infinite (eternal damnation and burning in a lake of fire). We use similar reasoning to argue that climate agnostics, who cannot fully discount the position that science has got it all wrong, should push for stringent climate policy nonetheless. Acknowledgment of scientific uncertainty about our understanding of climate change thus leads to only minimal downward revision of optimal mitigation efforts. Figure 1 plots the temperature profiles for both views of the climate. The dashed green line with temperature peaking at 3.4°C corresponds to the science view where decision makers price carbon at $14.7/tCO2 today to avoid climate change. 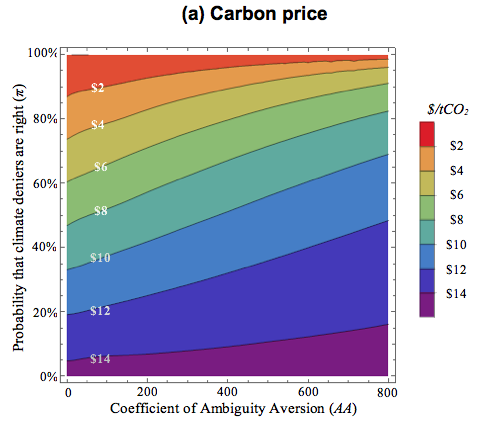 In fact, the optimal price of carbon increases to $18 and $73/tCO2 if marginal damages rise rapidly with global warming and policymakers use a lower discount rate than private agents (van der Ploeg and Rezai 2017). Under the deniers’ view global temperature is unrelated to human emissions and peaks at 1.3°C regardless of whether carbon is priced or not. Notes: The climate model of deniers has temperature peaking at 1.3°C, independent of anthropogenic emissions and climate policy. 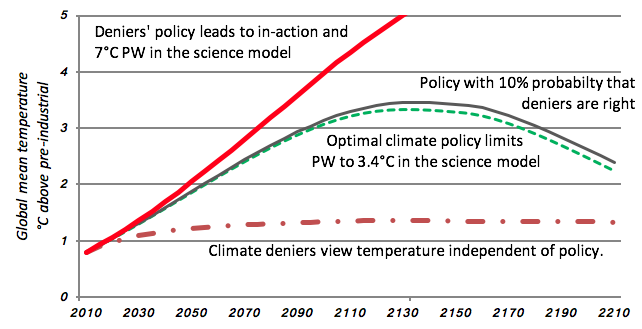 In a scientific climate model, policy limits peak warming to 3.4°C. Policy inaction as favoured by deniers leads to temperature increases of 7°C. Agnostic policy ascribing a 10% chance that deniers are right only increases peak warming by 0.1°C relative to the science view. We also plot temperature outcomes where one type of policy (price carbon or don’t price carbon) is implemented in the other type of climate view (science or denier). In the science (don’t price carbon) case, the absence of a carbon price leads to rapidly rising temperature, peaking at 7°C (solid red line). This scenario is commonly called ‘business as usual’. In the denier (price carbon) case, human emissions fall (not plotted) but temperature is unchanged due to the decoupling of global mean temperature and emissions. Table 1 summarises the four scenarios in terms of global welfare gains relative to the welfare predicted by the science view under business as usual in percentage of current world GDP. The first row assumes that the climate scientists’ view is correct. Wrongly not pricing carbon involves unfettered growth in emissions, temperature peaking at 7°C, and severe consequent damages to the world economy. However, if carbon is priced, temperature is stabilised and welfare is increased by 17% of world GDP. The second row assumes that climate change deniers are right. Temperature increases to 1.3°C regardless of policy and the economic future under business as usual is much brighter than what doomsayer scientists think. The benefit of removing severe climate change damage amounts to a 41% of world GDP. In a denier’s world, wrongly and unnecessarily pricing carbon and rebating the revenues introduces efficiency losses and a drag on economic growth equivalent to a 7% drop in world GDP. Notes: Welfare improvements relative to ‘business as usual’ are presented for the science and the deniers’ view of global warming (rows) and the corresponding two type of policies (columns). An agnostic policymaker prices carbon if the probability that deniers are right and global warming has only natural causes is smaller than 70%. The worst outcome for both climate policy and no climate policy occurs under the science model. Doing the best under all worst possible outcomes (max-min) is thus to price carbon. Climate change deniers do not tax carbon as they view climate change as exogenous. The corresponding outcomes (top-right entries in the table) are commonly called ‘business as usual’ if the science view turns out to be correct. If one follows Pascal and adopts the expected welfare approach with only these two policies, it is optimal to price carbon if the probability that deniers are right is less than 70% and not to price carbon otherwise. Since 97% of scientists and 58% of the general public in the US say that human activity is a significant contributing factor in changing mean global temperature (Doran and Zimmerman 2009), one can assume this threshold for pricing carbon is met. Agnostic policymakers who maximise welfare under the worst possible outcomes (i.e. the max-min decision criterion of Wald 1945) also choose to price carbon, because the resulting efficiency losses are much lower than the deleterious effects of future severe climate change (and 7°C peak warming). The same logic and climate policy applies if policymakers minimise maximum regret (Savage 1954). Both max-min and min-max-regret policies are the classical policy responses to model uncertainty. They maximise welfare or minimise regret under the worst possible view on the causes of global warming. So far, we have only considered an either/or choice (one either believes in God or doesn’t), but the modern expected-welfare approach allows for a continuous range of policy options. We find that maximising expected welfare with a 10% probability that deniers are correct does not alter the purely science-based optimal climate policy much – the initial carbon price falls from $14.7 to $13.3/tCO2 and expected peak warming rises by a mere 0.1°C (solid black line in Figure 1). If we take 3% for the climate specialists and 42% for the general public, as suggested in (Doran and Zimmerman 2009), the carbon prices are $14.3 (even closer to the figure chosen by the non-sceptic scientist) and $8.7 per tonne of emitted CO2, respectively. Modern decision theory extends the expected utility framework to allow for aversion to ambiguity about what the right climate model is (Klibanoff et al. 2005). This approach accounts for irreducible uncertainty and puts a premium on playing it safe when venturing into domains where different models give different outcomes. Accounting for ambiguity aversion (AA) effectively introduces caution by adjusting the probability that sceptics are right downwards (Millner et al. 2013), thereby nesting both the expected welfare approach (with AA = 0) and the extremely cautious max-min approach (with AA infinite) which pushes the probability that climate change deniers are correct right down to zero (Gilboa and Schmeidler 1989). Figure 2 shows iso-peak-warming curves for combinations of the subjective prior probability that climate change deniers are right (vertical axis) and the AA (horizontal axis). 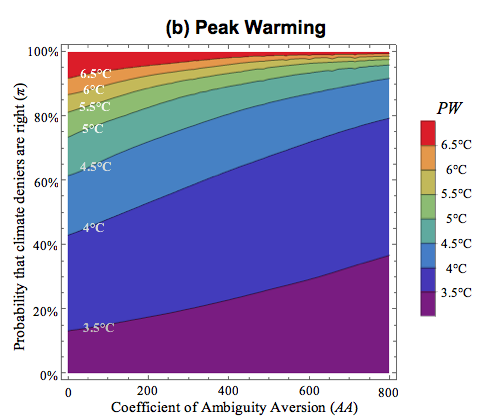 If AA = 0, peak warming increases by more than 0.5°C only for priors that deniers are right greater than a third. If AA = 800, this cut-off for the prior rises to 70%. Aversion to ambiguity about what the right climate model is biases priors toward the non-sceptic scientist and encourages more ambitious climate policy. This effect is small for low AA, but large for high AA. Even if policymakers assign a 50% (90%) chance to climate change deniers being right, allowing for a high degree of robustness but less than for the max-min policy biases this chance down to 20% if AA = 800 (2,000). This implies an initial price of carbon of $11.9/tCO2 and peak global warming of 3.6°C. Notes: The initial carbon price decreases and peak warming increases in the probability that climate change deniers are right (vertical axis) from $14.7 to $0/tCO2 and from 3.4°C to 7°C, respectively. Aversion to scientific uncertainty (AA, horizontal axis) lowers the willingness to tolerate high levels of warming. As AA approaches infinity, the initial carbon price increases to $14.7 and peak warming falls to 3.4°C regardless of prior probabilities and gives rise to the max-min policy. We conclude that the cost of avoiding the most harmful aspects of climate change is small compared with the cost of inaction, so robust policies – such as doing the best or minimising regret under the worst possible outcomes – call for pricing carbon. Even for less cautious policies than the max-min policies with finite but substantial degrees of ambiguity aversion towards climate model uncertainty, and subjective prior probabilities that climate change deniers are right as high as 20%, the price of carbon is close to the non-sceptic, scientifically optimal one. In fact, even if the subjective probability of climate change deniers being right were 50%, possibly due to the influence of the coal and shale gas lobbies, the end of the fossil fuel era would be delayed by only 30 years relative to the rational science-based view. This delay shortens as the prior probability that climate change deniers are right falls, or aversion to ambiguity, about whether scientists or deniers are right, increases. Agnostic decision makers might not want to make an assessment of the prior distribution of the different views of the climate as it is fundamentally unknown. In that case, the max-min solution, and thus the science-based policy, are appropriate. Not pricing carbon benefits current generations by avoiding the economic burden of climate regulation, giving politicians the subterfuge to avoid painful restructuring of carbon-based industries. Our results, however, discredit this wait-and-see approach. We have not set out to disprove or prove either the climate change deniers’ or scientific view, but have used modern decision theory to show that agnostics should decarbonise the economy rapidly as the consequences of erring on the ‘wrong’ side are too grave. The agnostic policymaker’s response to climate change deniers is thus strikingly simply – price carbon. Doran, P T and M K Zimmerman (2009), “Examining the scientific consensus on climate change”, Eos, Transactions American Geophysical Union 90(3): 22-23. Gilboa, I and D Schmeidler (1989), “Maxmin expected utility with non-unique prior”, Journal of Mathematical Economics 18: 141-153. Klibanoff, P, M Marinacci and S Mukerji (2005), “A smooth model of decision making under ambiguity”, Econometrica 73(6): 1849-1892. Millner, A, S Dietz and G Heal (2013), “Scientific ambiguity and climate policy”, Environmental and Resource Economics 55(1): 21-46. Nordhaus, W (2014), “Estimates of the social cost of carbon: Concepts and results from the DICE-2013R model and alternative approaches”, Journal of the Association of Environmental and Resource Economists 1: 273-312. Pascal, B (1670), Pensées (Translated by W F Trotter, London, Dent, 1910). van der Ploeg, F and A Rezai (2017), “The agnostic's response to climate deniers: Price carbon!”, CEPR Discussion Paper no 12468. Savage, L J (1954), Foundations of Statistics, New York, John Wiley. Wald, A (1945), “Statistical decision functions which minimize the maximum risk”, The Annals of Mathematics 46(2): 265-280. The ‘scientific’ model corresponds to version DICE-2013R of the DICE model. Strictly speaking, the International Panel on Climate Change allows for a very small probability that deniers are right but we will call the ‘science’ view the one which says that all anthropogenic carbon emissions contribute to global warming. The ‘denier’ model corresponds to a variant of DICE-2013R where anthropogenic emissions are assumed not to enter the atmosphere and the climate evolves independently of the economy, responding to exogenous and past emissions already in the system.